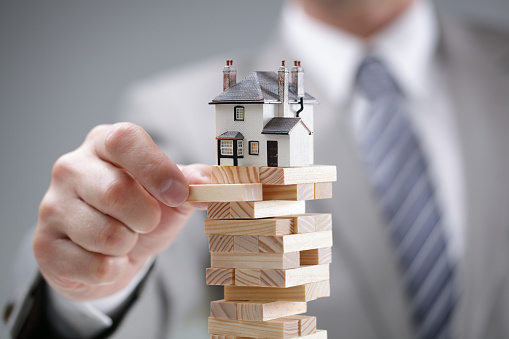 Many people underestimate the risk of buying a house with foundation problems and the extent of repairs needed. Foundation problems generally reduce the value of a home. It can also be very costly, stressful, inconvenient, and take a lot of time to repair. Repairing a home’s foundation is much more extensive than just doing home design or decor. And you don’t want to be shocked by tremendous costs after you move into your new home. So we’re here to tell you all about the risks and costs of buying a house with foundation problems. If you are considering buying a house with possible foundation problems you must get a proper evaluation from a structural engineer. While home inspectors are able to recognize the issue, they are usually not qualified to give a full evaluation. A structural engineer will inspect the house and let you know the exact cause and what needs to be done. A proper inspection and evaluation by a structural engineer will cost you around $500 to $700 and may even be as high as $1,000. Once, you’ve received the assessment of the foundation you need to get estimates from specialized foundation repair contractors. With these estimates, you’ll be able to negotiate a fair price better. The actual cost of repairs may vary depending on the extent of foundation issues. Minor repairs may include fixing and replacing gutters, putting epoxy injections in foundation cracks or bolting on steel braces to secure the foundation. Epoxy injections are around $350 to $450 each. Steel braces are about $70 to $500 each and must be spaced 6 feet apart along the wall. For major foundation repairs, you may need to install piers under the foundation. Each pier is about $1,200 to $1,500 and they need to be installed every 6 to 8 feet. If there is a considerable amount of damage you may need to rebuild part of the foundation. This can cost you tens of thousands of dollars. And in the most extreme cases, you may need to lift your house and put in an entirely new foundation, which could cost you up to $100,000! On top of foundation repairs, you may also need to fix foundation-related problems. That includes cracks in the drywall, crooked doors and windows, broken and uneven tiles, and even damaged floors. These household repairs must be done as well as fixing the actual foundation if you purchase the house. Signs of foundation problems are very apparent in the interior and exterior of the house. Whenever you are house shopping, check for these signs to see if there might be a possibility of foundation issues. Doors that stick, swing open, and don’t latch properly are possible signs of a foundation issue. Also, windows may be extremely hard to open and close. And in extreme cases, they may have cracked glass. It’s hard to tell if the floor is sloping when it is carpet. But, if it’s a hard floor you can test for foundation issues by dropping a marble on the floor and see where it rolls. This will show you the general pitch and direction of the slope. Due to the stress of a settling foundation, cracks will appear on the walls especially around the doors and windows. Cracks that are less than a quarter of an inch usually don’t require repair. A consistent pattern of large cracks could be a sign of the foundation shifting. Also, other signs that the ground beneath is settling evenly is if the sighting along the wall is bulging or there are step patterns in concrete footers. A cracked chimney is an indication that there might be a foundation problem. If posts or beams are leaning this is another sign that the foundation has shifted from its original position. Standing water near the foundation or if one side of the house is wet and the other side is dry means that a drainage issue needs to be addressed. Be sure to check all these signs and understand the risk and costs of buying a house with foundation problems before you decide to buy the house. If you are interested in learning more about mortgages talk to one of our experts by phone (800)346-8047 or email us at info@texaslending.com!